Did you just get back from a bad trip in New Orleans during Mardi Gras, and want to commemorate it somehow? Tattoos hurt, but psychedelic helmets certainly do not. Want a decent lid that won't break the bank, but will keep your noggin safe on the road? Scorpion may have just the thing for you. The Scorpion EXO-R410 Sugarskull helmet isn't made for women. It isn't made for men. It's made for people who enjoy listening to the Grateful Dead and stumbling around the French Quarter into the wee hours of the morning. Since indulging in your favorite substances isn't a great idea while riding, it's best that you express your inner head by donning a rad graphic straight out of N'awlins. Available in two colors schemes, Pink and Gold, you can make whatever statement you wish. Just be aware, beads are not included. We all know that helmets aren't just safety devices. They're like walking billboards, advertising how cool we are. Some people like boring, solid colored helmets. Other people, the ones with taste, know how important it is to look fly on the road. 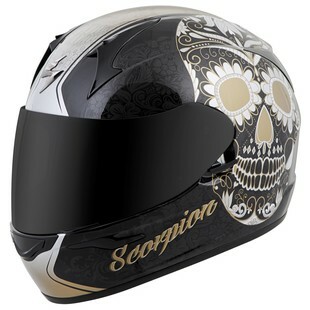 And for them, there's the Scorpion EXO-R410 Sugarskull.